Last Sunday I had the honor of enjoying one of the best meals I'm sure I will ever have in Dallas (or anywhere!). Like all cool things in Dallas, it was brought to my attention by my very in-the-know mom who, I must admit, is often the one telling me about cool things in Dallas. If she had her own blog, I would be toast. For the past few years my mom has quietly been involved with The Youth Village Foundation, a non-profit in Dallas that provides support, mentorship and vocational training to male teens that are serving time in the city's juvenile reform program. I say that she was quietly involved because although I heard of Youth Village's awesome programs from her all the time, from the P.R.E.P dog training (where young men train rescue dogs so they can be more easily adopted while the trainers benefit from the discipline and love of raising an animal) to Cafe Momentum (the pop up restaurant series that teams students in Youth Villages culinary program with top chefs in Dallas for incredible meals) she never mentioned what she did as far as donating her time or money to the program. As I came to learn, the young men need white button down shirts to look their best at Cafe Momentum and go on job interviews once they finish their program. Something as simple as a white shirt can be difficult to come by for a young man whose financial background is likely a strong contributor to the fact that he is serving time in the juvenile program. My mom has bought new shirts for the graduating young men for the past three years - without telling any of us! The cat was finally out of the bag when Youth Village offered her two complimentary seats to Cafe Momentum, which she promptly passed to me since she eats like a bird. I brought my favorite food blog friend Shannon at Feed Me Dallas as my special guest, and we were both blown away by the food and amazing stories of transformation and accomplishment from such strong young men throughout the night! Cafe Momentum is run by Chad Housler and Janice Provost of Cafe Parigi, but the location of Cafe Momentum changes for its monthly dinner depending on the lead chef. Former Cafe Momentum chefs have been Dallas greats such as Steven Pyles, Dean Fearing and others. 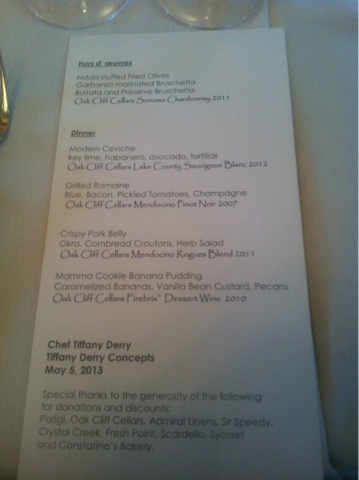 I was thrilled when our celebrity chef was Tiffany Derry of Top Chef fame and previously of Private Social! I love Southern food and was excited to see how she might add some elements of her Beaumont upbringing to the mix in her menu. Speaking of menu, I would like to add that I had heard about Cafe Momentum for a while and was eager to see and support such great work in action, but ye old gluten free issue and set menus by incredible chefs kept me from getting tickets. I finally got the nerve to email Chad and ask if there was any way they could make accommodations for a gluten free plate, and he was extremely enthusiastic, accommodating and friendly in his response. I thanked him at the dinner when I met him in person at Parigi, and he went on to say that he loves when special diet (gluten free, vegetarian, and others) come to Cafe Momentum since it helps the students learn how to take care of special guests. So not only did I not feel at all guilty for my dietary needs, they made me feel like I was gifting my chefs with an extra education! Ok, on to the glorious food pics! My camera lens was a little scratched, so you would be remiss not to catch all of Shannon's amazing pictures at her write up on Feed Me Dallas. 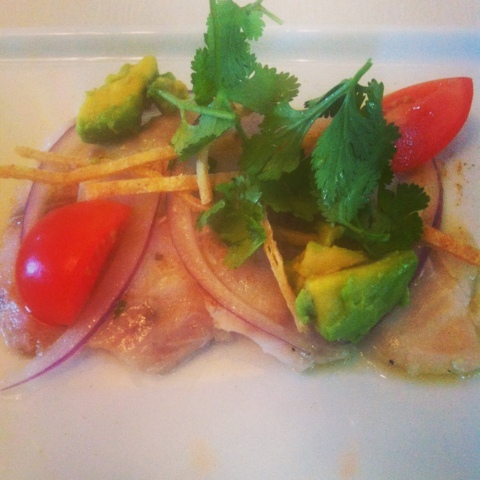 First course was modern ceviche. The fish was meaty and the key lime juice had such a perfect flavor! 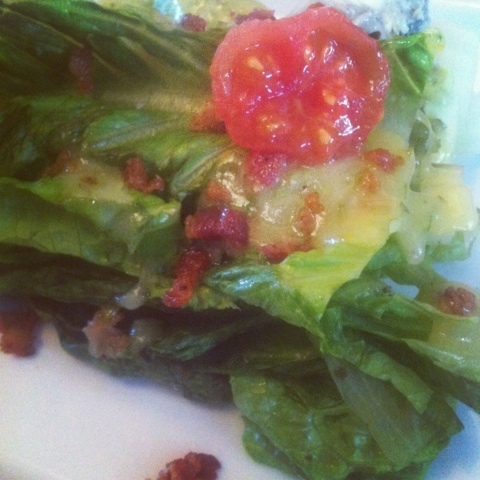 Next up was a grilled romaine salad with pickled tomato, blue cheese, bacon and a champagne drizzle. Blue cheese and bacon are the Bert and Ernie to my palette. A perfect pairing every time! 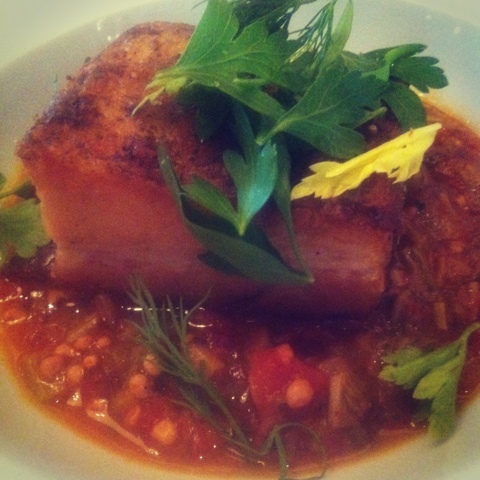 I had never tried pork belly before last Sunday, and I can't believe what I was missing. All Shannon had to do to get me on board was explain it was "like a big piece of bacon." The sauce it was in was tomato and okra based and I slathered it on every bite of my pork. You'll notice on Shannon's post that this dish was served with cornbread croutons, which were kept off my plate to make it gluten free. The last course was a decadent banana pudding! I love banana pudding but have not been able to enjoy it while out to dinner since I had to stop eating gluten. This recipe was divine and since the wafers were added on top, I got to enjoy a big dollop of banana pudding for the first time in years. 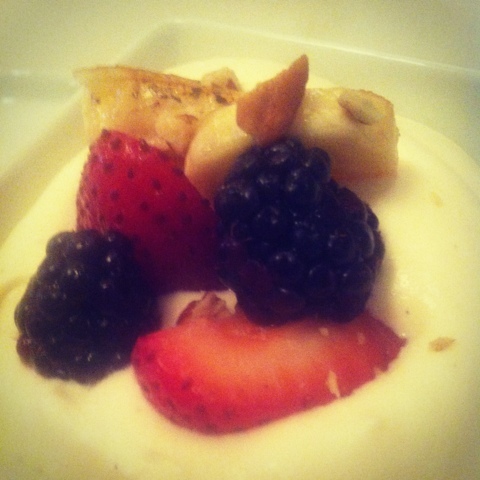 The fresh fruit was a perfect complement and the banana slices had a sugar crusting to them like creme brulee. While it will be a long, long time before I forget any of the food from this incredible night, the real take away was meeting the young men who are getting a leg up from the Cafe Momentum program. When I arrived at Parigi for the dinner, they were each dressed perfectly, standing at attention with a napkin folded neatly on their arm. So poised and professional, it took me a second to realize that these were the young men of Youth Village. At a second glance, though, I noticed in their faces how extremely young these boys were. I've been open about my mistakes in life, and what I've yet to mention is how hard it is socially to come back from a wrong turn you might have made as a youth. I've spent plenty of time excited about a new job opportunity and then nervous about a background check, and know that moving forward can be difficult when there's a stamp on your past trying to hold you back. Sometimes it's something on a piece of paper that shares more about your past than yourself, and sometimes it's your own confidence after feeling like you'll amount to nothing because you made a mistake. So much of my success was from having many opportunities to focus my time on and a strong family that I could lean on. What about the young men in Dallas who may not have that support? I am so thankful that Youth Village and Cafe Momentum are here, giving these young men a creative release and needed confidence through great food that is also prepping them for a bright future. While I don't know their "before" stories, the young men at Cafe Momentum were unlike almost any teenage boys I know. Chef Tiffany Derry came out at the end to thank her sous chefs for a great evening. She mentioned each young man by name and listed one of his accomplishments from the night. There were smiles on each boy's faces like nothing I had ever seen on a teenage male before. The boys would high five and hug each other as the room of happy guests erupted in applause. One of the leaders of the group said, "We'd like to thank you for this opportunity. When I got ready tonight my goal was to greet each of you, thank you for being here and introduce myself by my first and last name." Seriously, when does any teenage boy say something like that? Especially one that's been labeled by our court system as trouble or at-risk? Cafe Momentum is changing the lives of male youth in Dallas. You have to go see it for yourself. The feeling I left with was indescribable, and it wasn't just from the banana pudding. Great Article about Cafe Momentum! Oh.my.goodness my heart just melted. I had no idea that something like this existed in Dallas. Looking more into how I can help/participate now... thanks for sharing! Very aspirational and inspirational !
" When I got ready tonight my goal was to greet each of you, thank you for being here and introduce myself by my first and last name." MY MANTRA FOR GRATITUDE WITH ATTITUDE! Lilly... this is one of your best posts YET!! Wow, I have never heard of Cafe Momentum - what a great organization. I sent your link to the Mister. And how sweet your mom is to actively support such a great organization! Fellow Dallas blogger, here! Found you via 20SB and have enjoyed reading your witty posts (also, I'm just crazy about your living/dining room design; the colors are so vibrant). This place sounds marvelous; I'll be checking it out on your reference. Anyway, just showing a lil love. That sounds like a really, really awesome program. Also, please keep us posted on the job opportunity - I will keep my fingers crossed for you. Join the party with a comment or two!